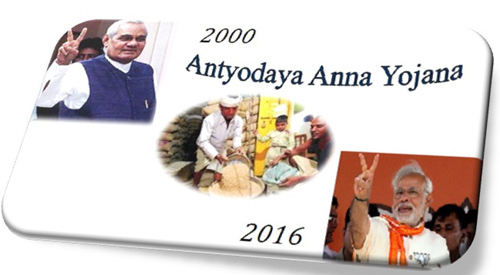 The Antyodaya Anna Yojana is not a new initiative that has been taken by the present government. The first announcement of a scheme like this was done in 2000. Under the scheme, the central government was going to assist the poor and the needy with ration at very low prices. The scheme was mainly for the people falling under the BPL category. According to the latest announcements made by the Ministry of Food, all the families falling in the AAY category will be provided with sugar at prices that are very low as compared to market rate. The government outlets will charge the AAY families only Rs. 18. 50 for every kilogram of sugar. It will put fewer burdens on the poor families by availing the benefits of the scheme. Cost of food grains – Under the AAY scheme, all the identified poor families will be provided with the advantage of getting food grains at very cheap rates. They will acquire wheat and rice, every month at only Rs. 3 and Rs. 2 respectively. The distribution of the food grains will be done through the public distribution system. Each family will get 35 kg rice/head. Generating special ration cards – Once the state and the central government has finished the task of identifying all the families that fall under the AAY scheme, they will be given different ration cards. The color of the passes will be different from the normal once. Endeavors of the state government – Apart from the central government, the state governments will also assist the families by providing the food grains to them at the low prices that has been set by the central authorities. Total amount of food grains – As the latest target of the BPJ government is to feed a whopping 25 million poor mouths, the central government will have to keep the a total of 30 lakh tons of food grains available, on a yearly basis. All the interested candidates must have their BPL cards. The certificate will ensure that these families and the respective people are too poor to even arrange two square meals a day. All the elderly, mentally and physically disabled, widows, lactating or single mothers will also be able to apply under the scheme provided that are able to prove that they are devoid of any other income source. The scheme will also provide help in acquiring food grains for the tribal families which will meet the above-mentioned requirements. The tribal families must not have any alternative source of income. As per the guidelines of the AAY scheme, all the identified families will be provided with a ration card that will be different from the standard ration pass. The color of the AAY ration card will be green. All families, living in rural, semi-urban or urban areas will be provided with a green ration pass, if they are enlisted under this scheme. As per the guidelines of the central government, all the interested candidates who want to register for availing the benefits under the AAY scheme will have to provide the BPL certificate and the income certificate as well. The candidates will also have to provide the proof of their claims that they do not possess any other ration pass. The AAY scheme is the brain child of the Central Government. Thus, it is the duty of the central government to bear the burden of the whopping cost of providing the food grains at very low prices. As per the reports, around 90% of all the cost of providing the food grains is provided by the Central Government and the rest is tolerated by the state authorities. With the new revision of the scheme, the exchequer will rise by 1.39 lakh crores. When considering the expense on a yearly basis, the total amounts to 2315 crore. According to the reports that have been published by the central government so far, the AAY scheme has been implemented and running successfully in the states of Himachal Pradesh, Madhya Pradesh, Rajasthan, Andhra Pradesh, Chhattisgarh, Uttar Pradesh and Union Territories of Dadra & Nagar Haveli. The main objective of the scheme is to provide the poor and the needy with basic ration. The scheme will assist the government in getting an upper hand on the poverty in the nation. As the central government was providing food grains at very low costs, all the BPL group people will be benefited under the program. Kerala Government has initiated a scheme to deliver food items. The Onam Kits is set to offer food items to 5.95 lakh families. The new kit was initially decided in a cabinet meeting headed by the CM, Pinarayi Vijayan. The state government eventually has started implementing free distribution of the Onam food kits at Rs. 6.91 crore outlays, which will get distributed free. The main objective of the Onam kits is to deliver food items to 5.95 lakh families and enjoy the Onam festival which brings rejoice and prosper in the life of the people in the state. Through this scheme, the Government aims at delivering the utmost enjoyment with the inclusion of vegetarian feast on the Thiruvonam, the second day of Onam. The festival will be held on 24 August this year.